Imagine an Ayurvedic fusion of Almond, Safflower, Sunflower, Avocado, Grape Seed, Sage Leaf and Apricot Kernel oils blended with 100% organic brown sugar containing alpha hydroxyl acids. Our delightful scrubs with Vitamin E remove cellular debris, heal your skin and simultaneously nourish and exfoliate your body surface; leaving you silky smooth and luminously alluring! Your skin will appear younger and feel soft and fresh. Are you a busy NYC dweller or an overworked, always on-the-go traveler? Our Rest & Rejuvenate Scrub gently removes dead skin cells while preserving indispensable moisture to keep your skin robust and noticeably radiant. This scrub features the essential oil of Lavender with the powerful herbal extracts of Kava Kava and Valerian. 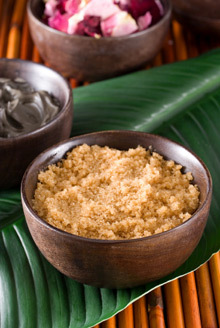 A Rest & Rejuvenate Scrub is the perfect tension buster to help calm the anxiety and stress of everyday life. Our Ayurvedic salon treatment is based upon centuries-old Ayurvedic therapies that support bliss and balance in life. Be prepared to experience our most nurturing treatment. Whether you have dry, dull or aged skin, we will determine your skin type based on a pre-treatment questionnaire to create an individualized exfoliation scrub customized to your particular needs. We will use specific oils, herbs, and aromas chosen to provide optimal balance and nourishment for your individual mind-body constitution. The Ayurvedic therapies are natural, gentle, and delightfully pleasing. This treatment will warm and lubricate to enhance circulation, eliminate toxins and deeply purify, leaving you relaxed and rejuvenated. Please arrive 20 to 30 minutes before your appointment to complete the pre-treatment questionnaire. Fortify your skin for an impeccable and enduring sunless tan. Our gentle, skin-renewing formula is an around-the-clock exfoliant. We use the natural, non-abrasive pineapple fruit enzyme, Bromelain. It's designed to remove dead cells from the skin's surface by polishing the uppermost layer of your skin. The outcome will leave you with healthy skin cells and an experience that can lift your mood and affect your outlook as you continue your day or evening! Abhyanga is an ancient Indian Ayurvedic oil bodywork therapy for healing and detoxifying body, mind and spirit. 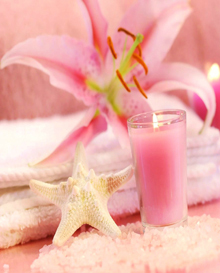 This ayurvedic detox and stress reduction therapy is performed by herbal oils & creams. It incorporates an aromatic combination of oils prepared with herbs warmed to your Dosha type. A variety of Ayurvedic techniques is applied to work along the energy channels of your body in a synchronized manner to restore the flow of vital energy, Prana, where it has become blocked. Warm oil is the best remedy for Vata which is governing energy for healthy body and mind. This is one of the most popular therapies in Ayurveda bodywork treatments. Please note : Abhyanga herbal oil & cream bodywork therapy is not massage therapy. It differs from Western massage. We understand that balancing work and life can be a struggle for even the most resilient person. This is why we have designed a De-Stress On The Go remedy for anyone who needs to immediately unwind. We will customize your treatment to target your most-desired back, shoulders, neck and scalp areas to eliminate tension and stress. Your energy will be restored while at the same time you will experience an overall feeling of well-being and relaxation - under an hour! shoulder and lower back tension and improve your circulation. Let us turn your necessity into a luxury! holistic bodywork treatments in the privacy of your residence or hotel room. This treatment will ease fatigued muscles & soothe the senses of the most stressed out New Yorker or weary traveler. Our products are made from six vitamin-rich, deeply moisturizing oils - the perfect solution for dry skin, fine lines and wrinkles. We will customize a treatment to your specific needs in any modality, improving circulation, boosting your immune system, helping to relieve muscle tension and increasing flexibility. Our certified practitioner has years of experience in all therapeutic/spa modalities listed. last minute booking to fit your schedule. Mango Ginger Scrub, spice up your day with sweet enchantment.